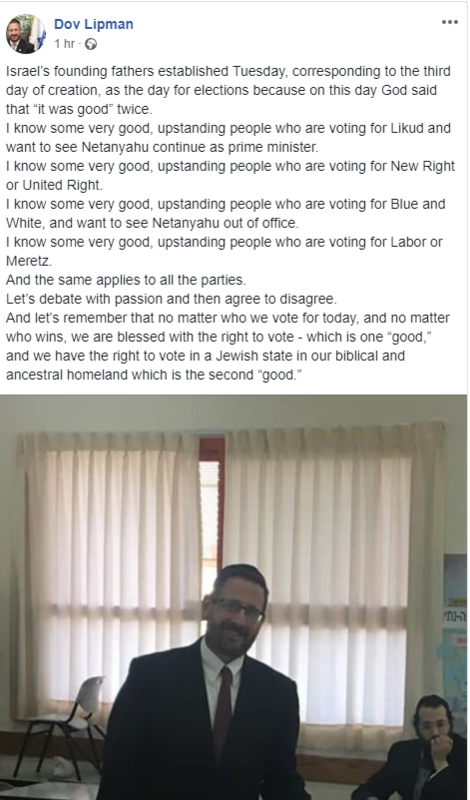 This beautiful post was made by Dov Lipman today, on the day Israelis go to the polls. 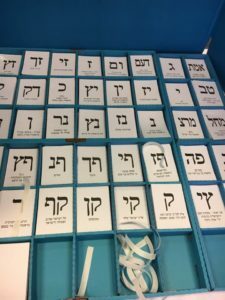 It has been a long election – not by US standards, but certainly by Israeli ones. The beauty of what Dov Lipman wrote is a reflection of Israel itself. Today, he reminds us, good people are going to vote. In many cases, these good people will vote for different candidates. Incredibly, over 40 parties are running in today’s election. Most won’t pass the threshold. For some, it was simply a chance to push their agenda and get some “free” publicity (like the Missionary party). For others, there will be great disappointment as they disappear, at least for a few years, from the political scene. And, it has been an election of disproportional voter harassment. We’ve been spammed with messages, emails, fliers on our cars and even prerecorded phone messages. Most Israelis are just happy that the election period is over and don’t expect real change. Sadly, like most elections, it has been filled with division and some insults that break the heart. In the midst of the elections, a 37-year-old hope was fulfilled. The remains of a soldier who fell in battle were found in Syria by Russian soldiers. Two years ago, Prime Minister Benjamin Netanyahu voiced a request to President Vladimir Putin that Russia help in the search. Russian soldiers finally found the remains, Putin called Netanyahu. Netanyahu flew to Russia to confirm and return Zechariah’s remains. And so, in an emotional funeral attended by thousands, 37 years after he went missing in action, Zechariah Baumel was laid to rest in the National Military Cemetery in Jerusalem. Hard to believe, as Israelis rejoiced and cried at the same time, Kachol Lavon candidate Benny Gantz chose to politicize this sad national “celebration”. He accused Netanyahu of politics in returning the body now. And no, Israelis don’t believe that accusation or any of the other desperate last minutes comments by Benny Gantz are true. Yes, there were other negatives but Dov Lipman wrote the truth. Or, half of it. The first part, as he so beautifully wrote, is that we are blessed to live in a country of free elections. A country where everyone is represented. What he didn’t write (and the reason I’m writing now) is the second half. Of course, we know that we are blessed to vote, and blessed to vote in our homeland. But more, we are blessed that tomorrow, we will accept the results of our democratic election and move forward. Soon, one party will form a coalition and rule for the next period of time. For those who are disappointed by the results, they will go to work and wonder when the next election will be. And, for those who are happy with the results, they too will go to work and wonder when the next election will be. What we don’t do is what has been the reality in the United States for the last three years. Following our elections, tomorrow and next week will be as it was before the elections. There will be no marked increase in violence. No one will walk the streets insulting others because of their vote. No one will riot. Nowhere, will someone walk into a store in Israel and be insulted for wearing any hat with the slogan of any candidate. Racism will not increase; looting will not take place in major cities. As in the US, our media leans to the left, and yet the news reports will be normal and even somewhat rational, EVEN if the right wins again. What has been missing in the US, as I have often written, is a sense of unity, a shared future, and a prayer that the elected official will indeed continue to make this country great. And if, during the next few years, our enemies again attack us (as is likely to happen), the opposition will quickly stand behind the Prime Minister and all of Israel will unite. Together, for the next few years…until the next elections…we will be what we are today. A democracy. A unified country. Israel. So, as Israelis go to the polls, I wish you all wisdom in choosing. Some very good, upstanding people are going to vote in the coming hours. On this, Dov Lipman is correct. I doubt he and I will vote for the same party. We certainly haven’t in the past. But ultimately, we are stronger for our differences. More, we are stronger for the simple fact that we all put the “Jewish state in our biblical and ancestral homeland” at the top of our agenda. Right or left. Religious or secular. Jerusalem or Tel Aviv. Young or old. Israel. Thank you, Dov Lipman. But more, thank you, Israel. Of course, thank you to the parties and candidates. But most importantly, thank you to the God of Israel and the people of Israel. And tomorrow? Tomorrow never changes. The sun will shine and we’ll go to work feeding our families, building our communities and our families.